If you own a home or building in Oak Park or River Forest and are curious about its history, archival research at the OPRF Museum may help answer some of your questions and solve some of those mysteries. Researching the history of your home can be an exciting and fun pursuit, and you might even find a surprise or two! Once you have all the answers, consider showcasing your property with the purchase of an historic plaque from the Historical Society. You've never done house history research before? Click here for ten tips that will help you get started. Interested in marking your home or building with an historic plaque? Click here for information about our Historic Plaque Program and how to apply. Below is just a partial list of resources in our archives that are of particular interest and value to house and building historians. The collection includes more than 1000 blueprints from River Forest for homes built from 1950 to present, as well as a small number of blueprints for Oak Park buildings. Promotional photo books from the late 19th to the early 20th century contain historic photos of residences and buildings and often include the owner’s name at the time the photo was taken. Some examples are Picturesque Oak Park (c. 1888), Album of Oak Park Views (1893), Oak Park 1896, Halley’s Pictorial Oak Park (1898), Oak Park Beautiful (1907), Glimpses of Oak Park (1912), River Forest—A Village of Homes (c. 1915), and River Forest Land Association Beautiful, Substantial Houses (c. 1915). Microfilm copies of federal census population schedules for Oak Park and River Forest, 1850–1930 censuses, are available in the Research Center. A set of maps showing enumeration districts for each census year serves as a finding aid to help narrow down census searches when an address or neighborhood is known. 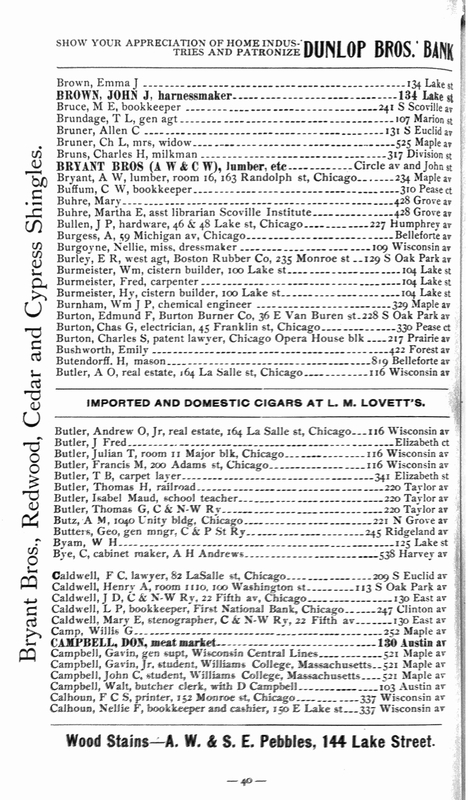 Oak Park & River Forest city directories, 1886–1930 (directories were not published every year and there are gaps). Includes names and addresses. Some directories include family members, occupations, and reverse directories by address. Telephone books, 1912 to present (some gaps). Included are Oak Park & River Forest telephone directories and west suburban phone books. The Oak Park and River Forest sections of the Chicago Blue Book (social register), 1883–1916; and 1932 Oak Park Social Register. Miscellaneous directories include a 1918 directory of automobile owners and a 1907 directory of south Oak Park. 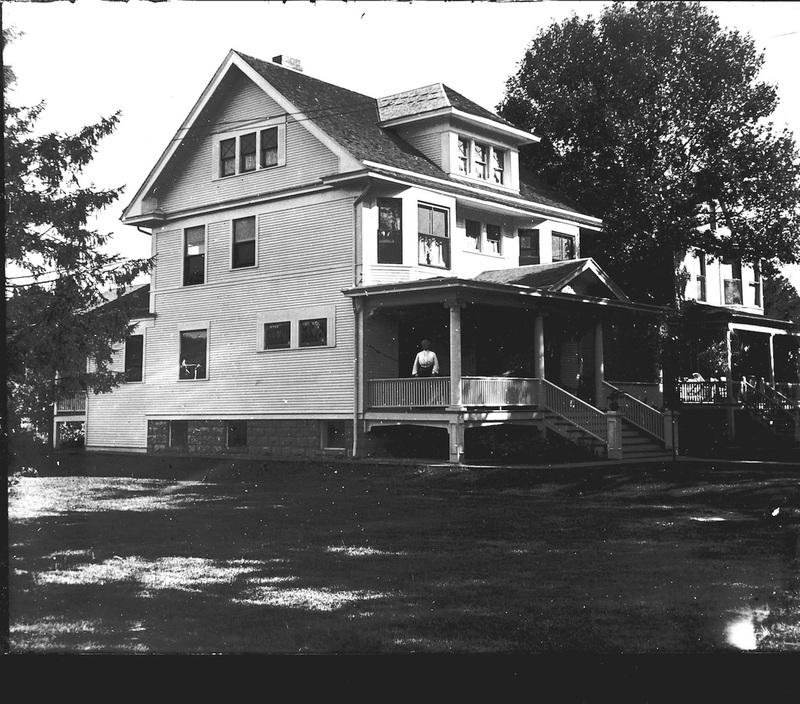 The Historical Society has several indexes and surveys that highlight the house and building architecture in our sister communities, including The Hasbrouck Sprague Survey of Historic Architecture in Oak Park, and the Steiner Index—notes from architectural historian Frances Steiner pertaining to historic buildings and houses between 1896–1916. Also available are surveys of the three historic districts in Oak Park: Gunderson District, Ridgeland–Oak Park District, and Frank Lloyd Wright Prairie School of Architecture District, as well as surveys of Downtown Oak Park, Madison Street, and other neighborhoods and business districts. Oak Park and River Forest Sanborn Fire Insurance maps for the following years: 1895, 1908, 1930, 1948, 1951, and 1968; and River Forest only for 1961. These illustrate the location, footprint, and building materials used for houses and buildings, street by street. Other specific maps include Cicero and Proviso Township subdivision maps, early subdivision maps, the Oak Park Yaryan Central Heating System Map, city directory maps, and a variety of other maps from the two villages from the 19th century to the present. Oak Leaves, 1902 to early 1990s. Bound volumes; some missing issues (articles are clipped from Oak Leaves and Wednesday Journal newspapers to the present). Forest Leaves, 1914 to 1922, 1935, and most years from October 1940 through 1991. Bound volumes. 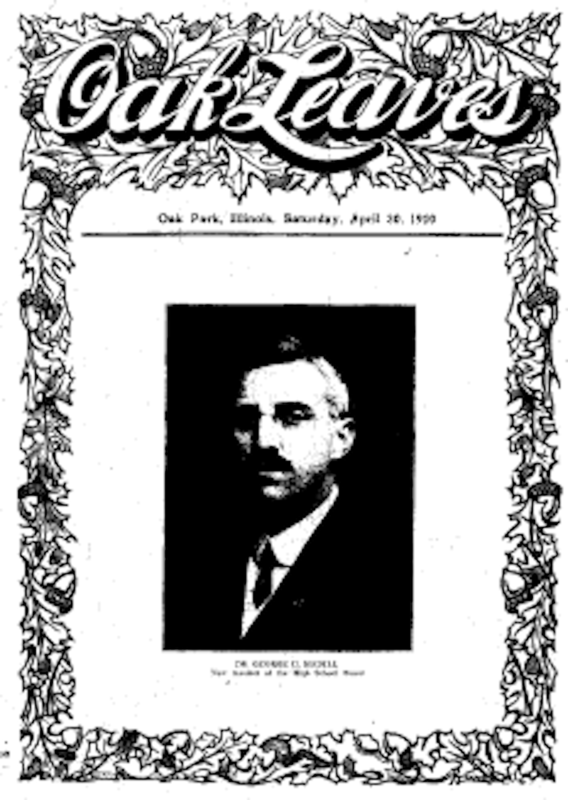 Incomplete and scattered holdings of other local newspapers, including: the Oak Park Reporter, 1887–1890; Vindicator, 1899–1901; Oak Park Argus, 1900–1902; and the Oak Parker, 1920s and 1930s. Collection includes thousands of photographs and hundreds of postcards of individual buildings, houses, and general street scenes organized by street. Philander Barclay Photo Collection. Seven binders contain over 1,000 photos taken or collected in the late 19th and early 20th centuries by local historian Philander Barclay (1878–1940). The Historical Society has the records of former Oak Park real estate business W.R. James, and River Forest firm Cusack Realty (circa 1935–1995). These include listing sheets with photographs, home descriptions, asking price, property taxes, and owner’s name. The Siler Index is a record of over 100 years of newspaper and real estate listings, including references to building permits, property sales, transfers, and more. The street files contain newspaper articles and references from other publications pertaining to specific houses and buildings on most streets in River Forest and Oak Park.